Gripping adventure, brilliant inventions, snarky humor, and fairy tales made real! 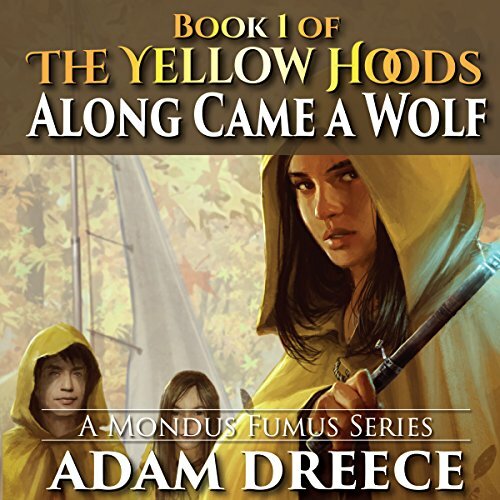 Welcome to book 1 of The Yellow Hoods, the seemingly innocent beginning of this clean young adult series that's great for kids and adults alike. Here are some of the amazing fairy tales, nursery rhymes, and classic stories woven into the fabric of The Yellow Hoods series: Little Red Riding Hood, Three Little Pigs, Santa Claus, Hansel and Gretel, Rumplestilskin, Beauty and the Beast, Humpty Dumpty, Chicken Little, Alice in Wonderland, Simple Simon, and Rub-a-dub-dub. You'll discover secret societies, snide villains, and heroic changes of heart. There was a lot to like about this listen. It was creative and fun and borrowed from childhood stories that we all love. Good versus bad was on display and I cheered when the bad guys went down. The Yellowhoods were two girls and a boy and they were fearless. I loved their friendship and how they problem-solved. This is definitely a YA book but don't let that stop you. The narrator was excellent. There were a considerable number of characters and accents and Althens became them all. This was a great start to a new series. Fairy tales with a Sharp Right! Adam Dreece has taken threads from a variety of fairy tales and nursery rhymes and woven a story to capture the imaginations of a new audience. In this initial tale of the Yellowhoods series, we meet Nikolas Klaus, his daughter, Jennifer, and 12 year old granddaughter, Tee. Tee is one of the Yellowhoods. She and her friends are called this because of the yellow cloaks they wear. Nikolas is an amazing inventor. His abilities are well known, but not the specifics of his inventions. “The Wolf” shows up looking for Tee’s Grandpa to see what “goodies” he may have that could be exploited. Who is more wily? The Wolf, The Yellowhoods, or Mr. Klaus? Susie Athens does an excellent job of narrating this story. The voices she creates for each character are distinct and capture the characters exceptionally. Her French accent for Leloup is eerily perfect. If you enjoy fairy tales with a kick, laced with action and adventure, I would recommend Along Came a Wolf. I’m betting you will want to continue with the rest of the Yellowhoods ‘ tales. Everything you ever wanted in a fairy tale....so many intricate weavings of all sorts of legendary stories, this takes you on a journey from old to new and everything in between. Really great story, enjoyed getting to know the characters and follow them along on a great adventure. I'm very (very haha) far from a young adult, but enjoyed it just the same. I give all stories/books I read/listen to a clean-slate, fair shake, I just let myself get into the story and see how I feel at the end. I'm not picky about if this is realistic or if a person would really do that, etc etc etc.. I just listen and enjoy. I really enjoyed this one, I took a chance on something that wasn't my usual listen, and enjoyed it very much. Writing and narration awesome!